[CIVIL WAR]. ANNA BIGELOW. Autograph Manuscript Signed unique calligraphy book with illustrations, pressed sea weeds, and hand lettered four lines of verse titled ‘Sea Weeds.’ New York, N.Y, 1864. 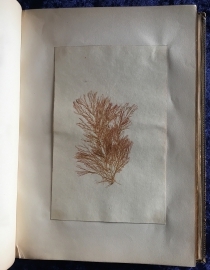 7½ x 10½ on 60-plus pages with 31 moss examples interleaved. The great success of an earlier Chicago fair inspired many women in the North to become involved. 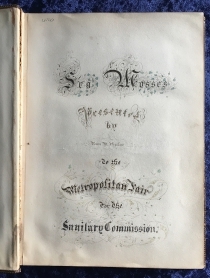 The Metropolitan Fair included everything from “Architectural Ornaments” to “Wines & Liquors” to “Wholesale Millinery Goods.” Commemorative and ceremonial objects were often specially designed for the Sanitary fairs. 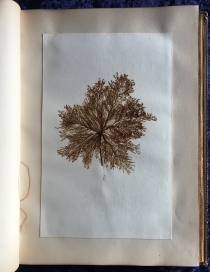 Anna Bigelow’s album of sea mosses may have been displayed in the “Arrangements and Decoration” section. 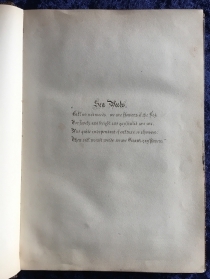 The elaborately hand lettered and decorated title page of this album bears a small signature “Ellsworth” and “819 Broadway.” Henry W. Ellsworth is listed in New York’s Manual of the Board of Education as a penmanship instructor at School No. 47 on Twelfth Street, between Broadway and University Place (p. 295). 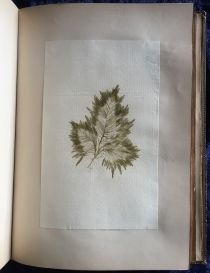 There is also an inscription “Drawn by E. W. Gandy, 1864” at the top of the front free endpaper. All edges gilt. 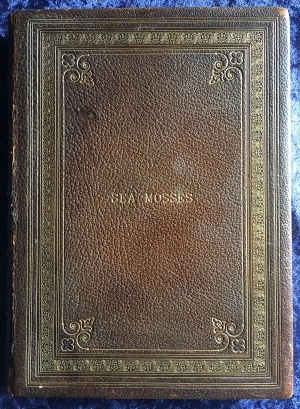 Elaborately gilt stamped brown morocco gift binding with white silk linings, with gilt title “Sea Mosses” at front board, and “Album” at spine. A bit chipped top of spine. Internally, a bit marked at the silk linings. 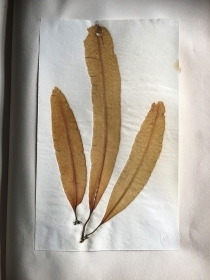 The plates in very good condition, with the each sea moss plate a delicate floral arrangement. Front cover detached. Some soiling and foxing.